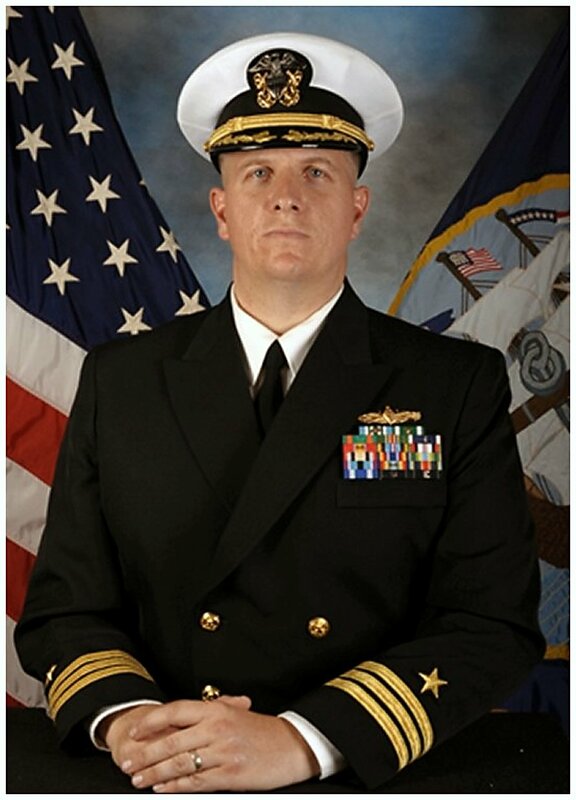 22 October 2016: Commissioned at the Renaissance Center, Detroit, Michigan; Commander Michael P. Desmond (LCS Crew 103) in command, assigned to LCS Squadron One at San Diego, Cal. 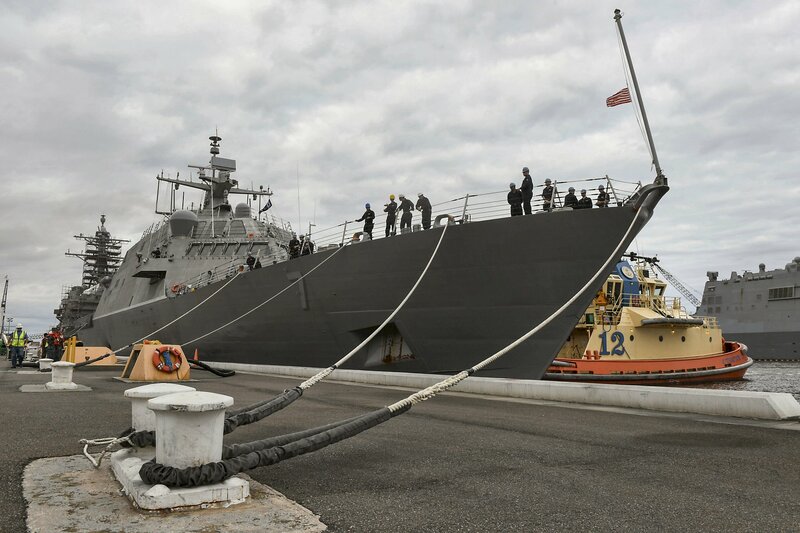 30 December 2016: Welcome Ceremony held at Naval Station Mayport, homeport reassigned to LCS Squadron 2 at Mayport, Fla. 1.) 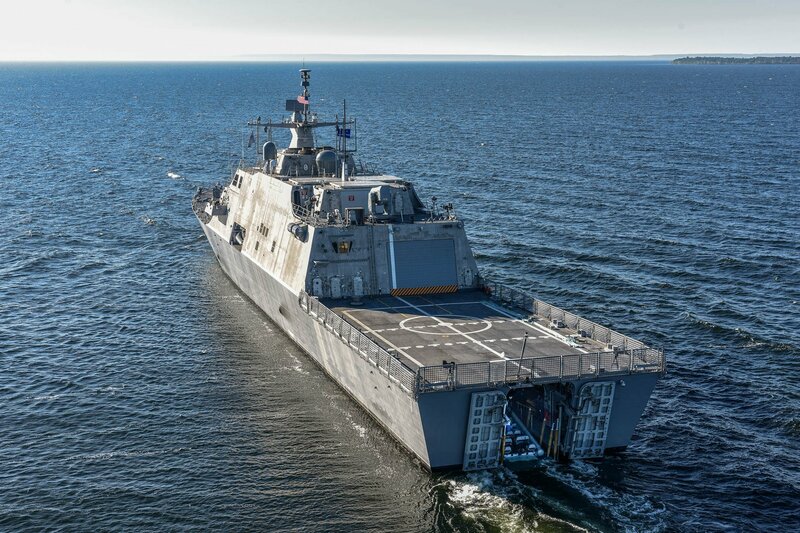 The contract option awarded to Lockheed Martin Corporation is managed by Lockheed Martin's Maritime Systems and Sensors division in Moorestown, N.J. 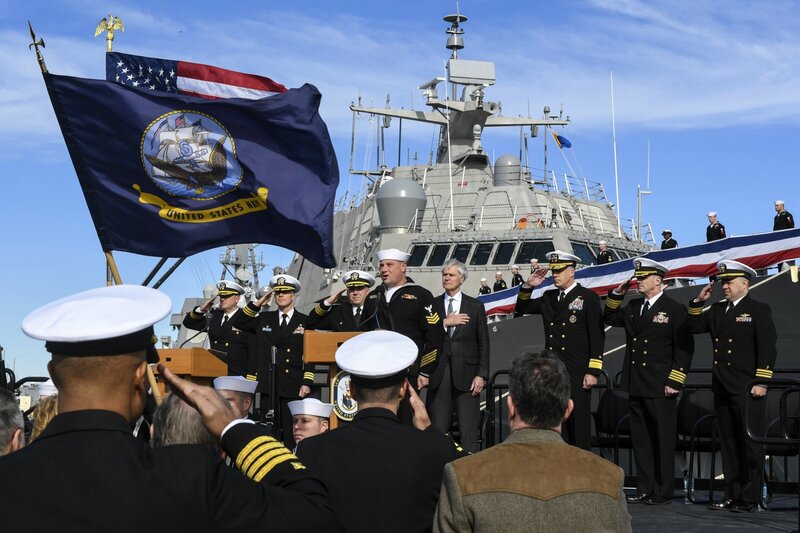 The Lockheed Martin team includes: Marinette Marine shipyard, Bollinger Shipyards, Gibbs and Cox naval architects, Izar of Spain and Blohm & Voss naval shipbuilders. 2.) 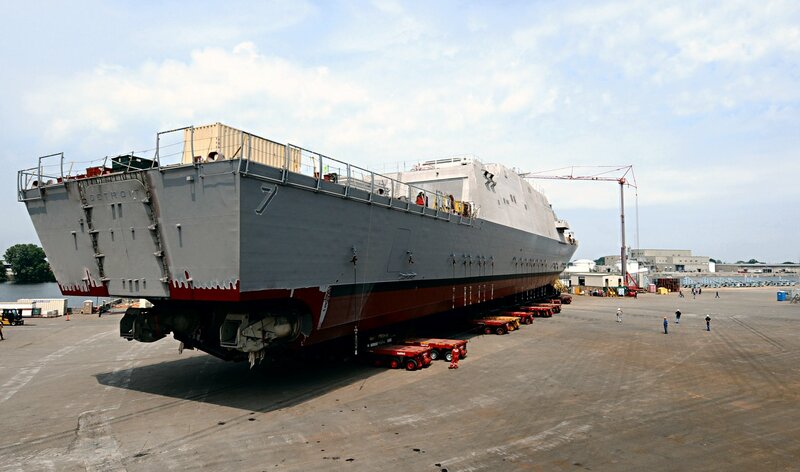 The contract option awarded to General Dynamics is managed by Bath Iron Works at Bath ME. 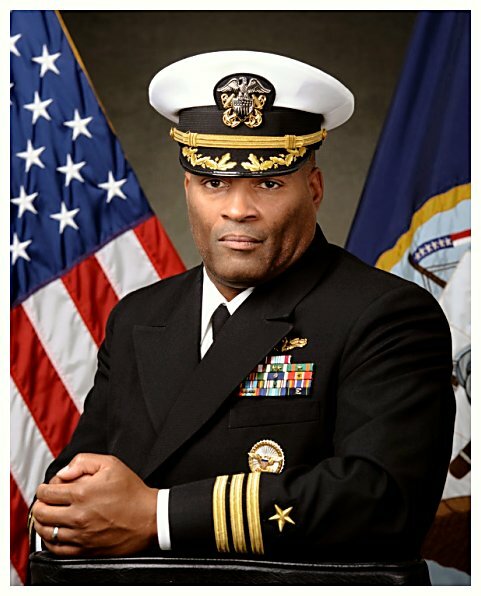 The major members of General Dynamics team are: Austal USA, based in Mobile AL; BAE Systems, Rockville MD; Maritime Applied Physics Corporation, Baltimore MD; CAE Marine Systems, Leesburg VA; Northrop Grumman Electronic Systems, Baltimore MD; General Dynamics Armament and Technical Products, Burlington VT; General Dynamics Electric Boat, Groton CT; General Dynamics Advanced Information Systems, Washington DC; and General Dynamics Canada, Ottawa, Ontario. "Detroit, The Ship" - "Detroit, The People"
172k 27 May 2004: Washington, D.C. - The U.S. Navy announced today that Lockheed Martin Corporation - Maritime Systems & Sensors Division, Moorestown, N.J., will be one of two defense contracting teams awarded contract options for final system design with options for detail design and construction of up to two Flight 0 Littoral Combat Ships (LCS). 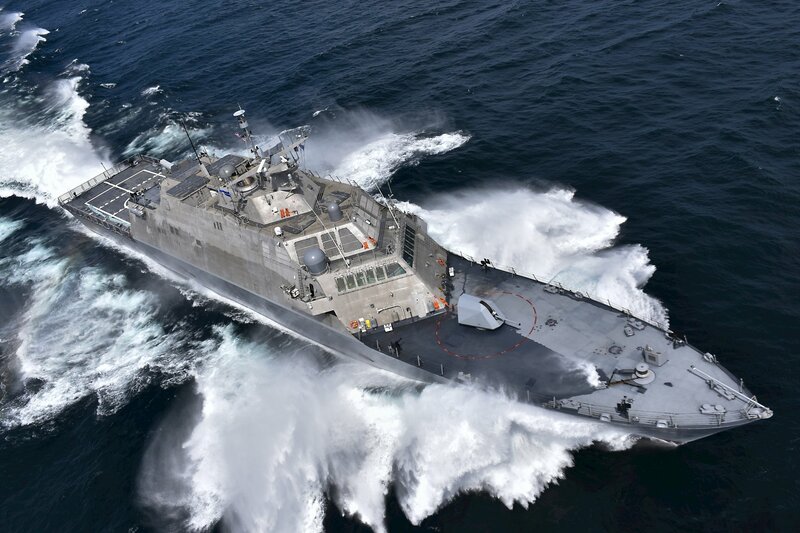 The LCS is an entirely new breed of U.S. Navy warship. 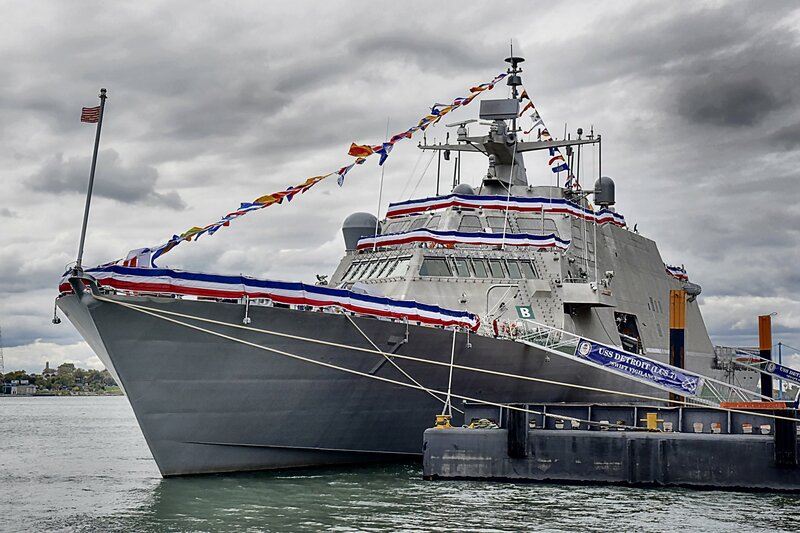 A fast, agile, and networked surface combatant, LCS's modular, focused-mission design will provide Combatant Commanders the required warfighting capabilities and operational flexibility to ensure maritime dominance and access for the joint force. 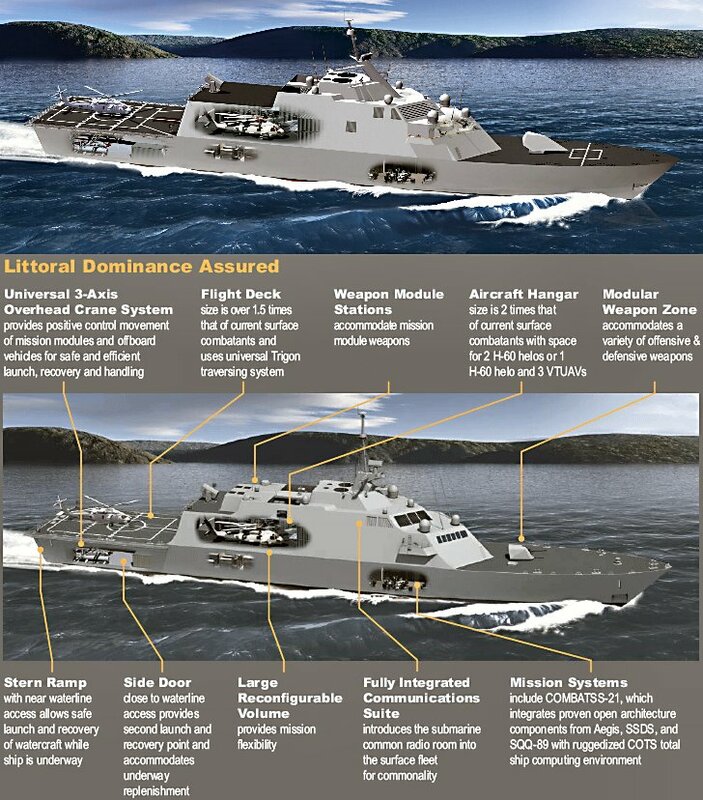 LCS will operate with focused-mission packages that deploy manned and unmanned vehicles to execute missions including, Special Operations Forces (SOF) support, high-speed transit, Maritime Interdiction Operations (MIO), Intelligence, Surveillance and Reconnaissance (ISR), and Anti-Terrorism/Force Protection (AT/FP). 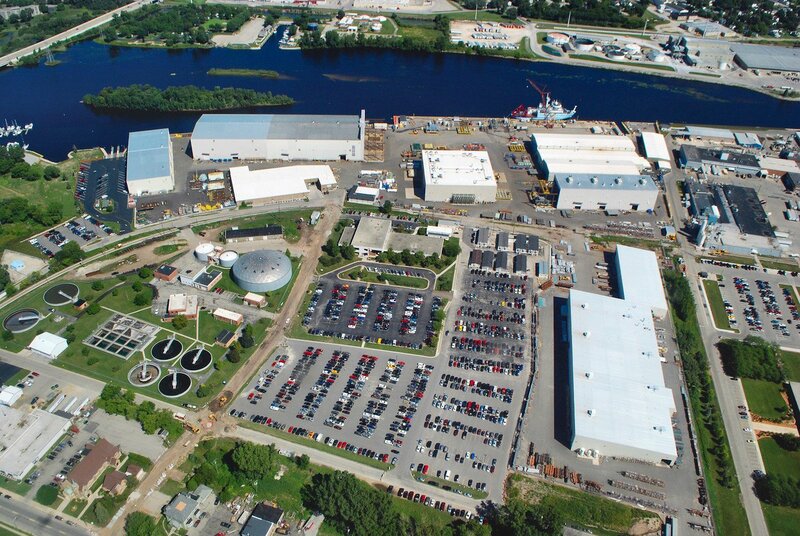 365k undated: Marinette, Wis. - An aerial view of Fincantieri Marinette Marine, which was founded in 1942 along the south bank of the Menominee River in Marinette, Wisconsin. The river forms the border between Wisconsin and Michigan's Upper Peninsula. 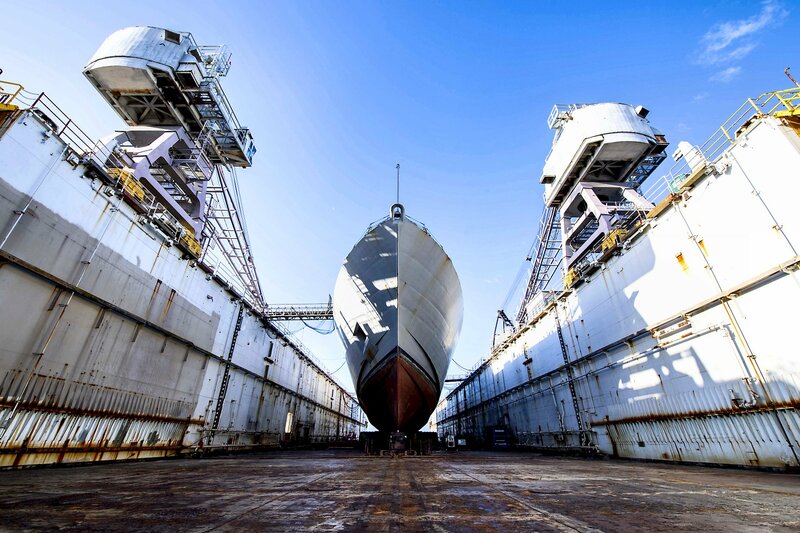 Originally built to meet America's growing demand for naval construction, today FMM is one of the premier builders of vessels for the U.S. Navy and Coast Guard. 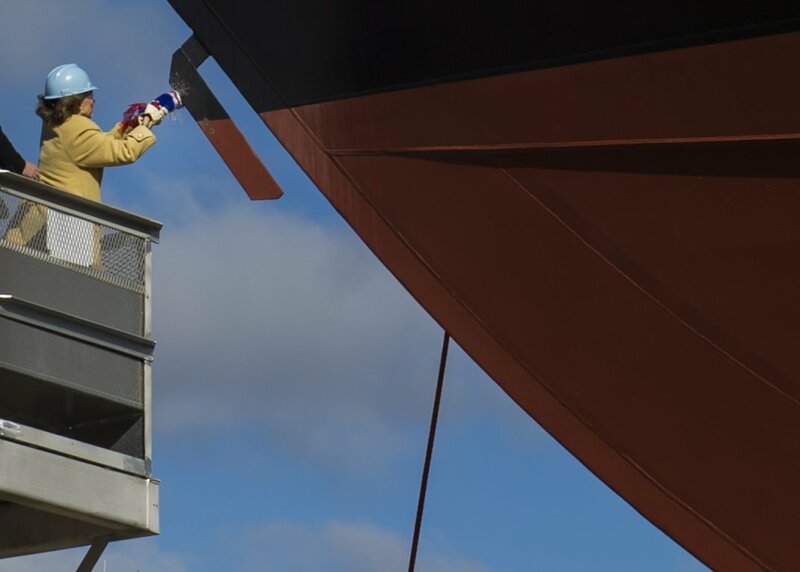 From humble beginnings with a contract to build five wooden barges, FMM has grown into a world-class shipbuilder, having designed and built more than 1,500 vessels. 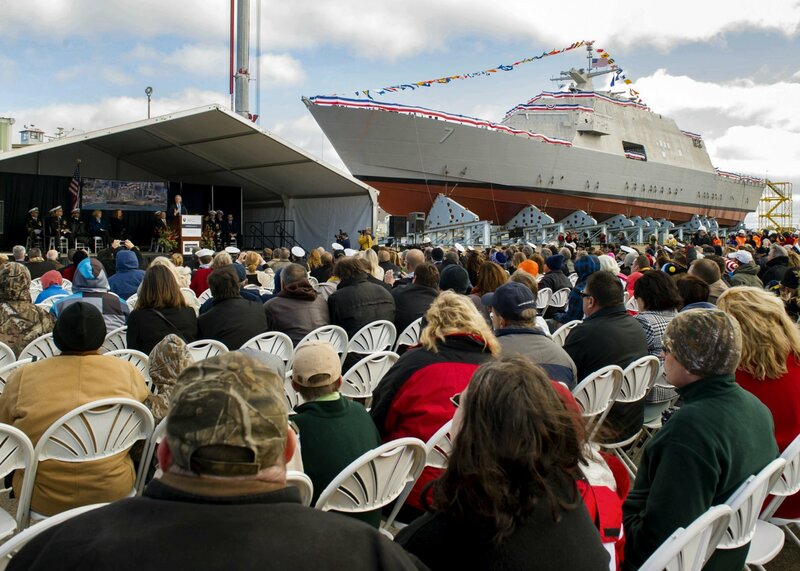 In conjunction with the Lockheed Martin Corp., all of the planned Freedom Class LCS's will be built here, beginning in 2005 with USS Freedom (LCS 1). 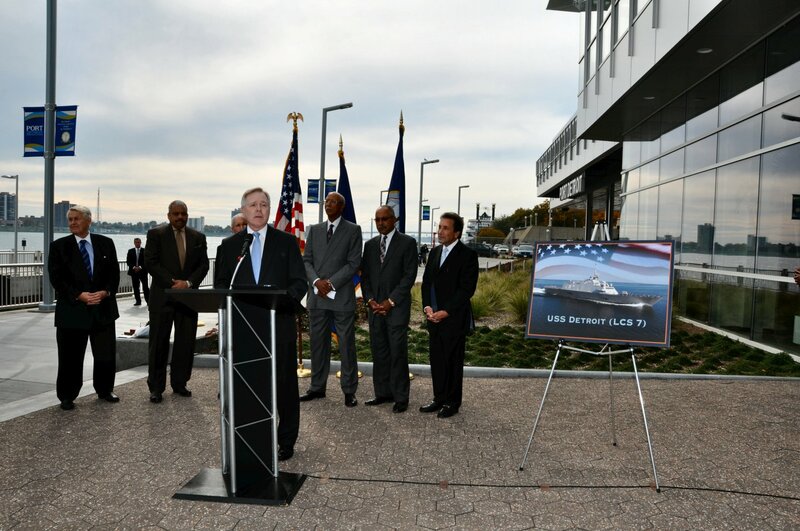 172k 10 October 2011: Detroit, Mich. - Secretary of the Navy Ray Mabus celebrate the naming of the seventh littoral combat ship, USS Detroit, during a press conference on the Detroit international riverfront. 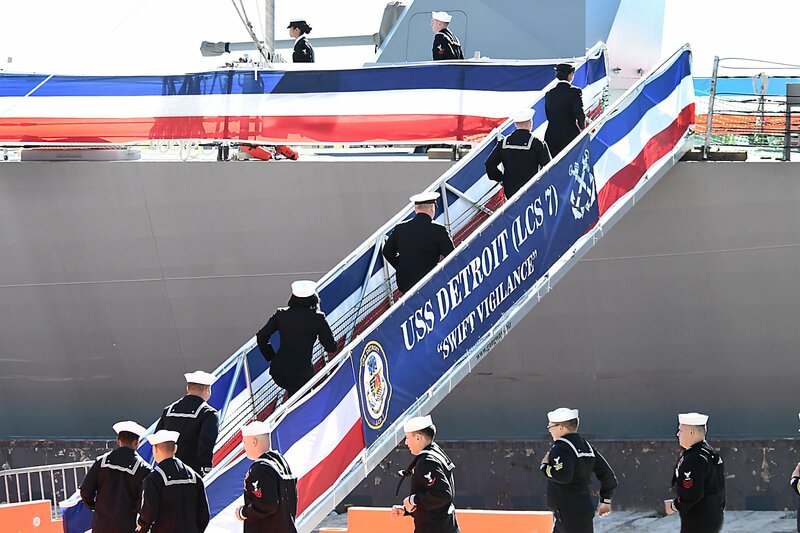 Maybus was joined by U.S. Sen. Carl Levin, Detroit Mayor Dave Bing, members of the Detroit/Wayne County Port Authority and sailors assigned to Navy Operational Support Center Detroit and Navy Recruiting District Michigan. 172k 21 February 2014: San Diego, Cal. 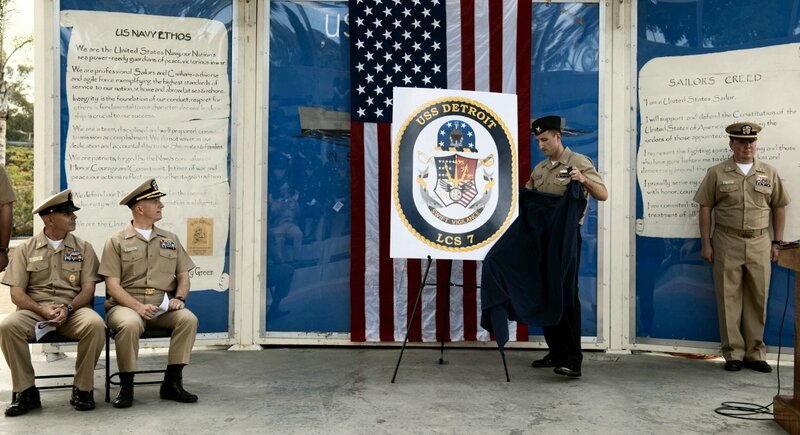 - A sailor unveils the crest of the Freedom-class littoral combat ship USS Detroit (LCS 7) during a ceremony. Detroit is under construction and is approximately 60 percent complete. 172k 27 June 2014: Marinette, Wis. - A three photo series of Detroit being moved from the Fabrication Building to the launch cradle on the bank of the Menominee River. 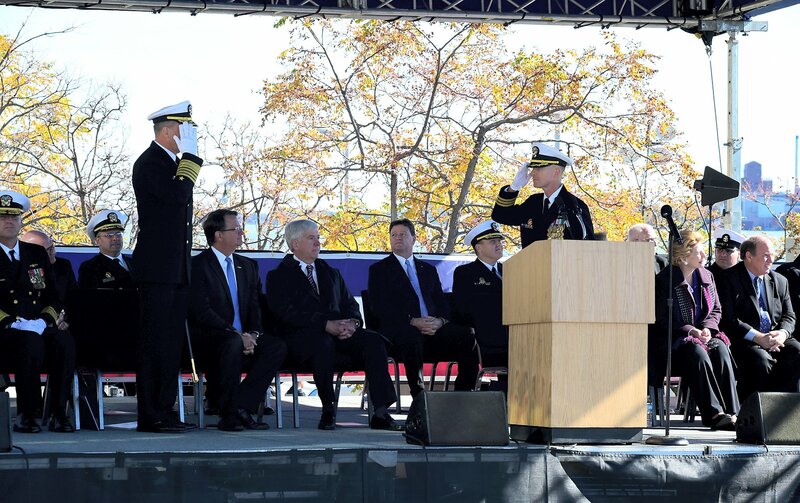 172k 18 October 2014: Marinette, Wis. - Secretary of the Navy Ray Mabus delivers remarks during the christening ceremony for the littoral combat ship Pre-Commissioning Unit (PCU) Detroit (LCS 7) at Marinette Marine Corp. shipyard in Marinette, Wis.
172k 18 October 2014: Marinette, Wis. - Ship's sponsor Barbara Levin breaks a bottle of champagne across the bow during the christening ceremony for the littoral combat ship Pre-Commissioning Unit (PCU) Detroit (LCS 7) at Marinette Marine Corp. shipyard in Marinette, Wis.
263k 18 October 2014: Marinette, Wis. - Secretary of the Navy Ray Mabus speaks with media after the christening ceremony of the future littoral combat ship USS Detroit (LCS 7) at Marinette Marine Corp. shipyard in Marinette, Wisconsin. 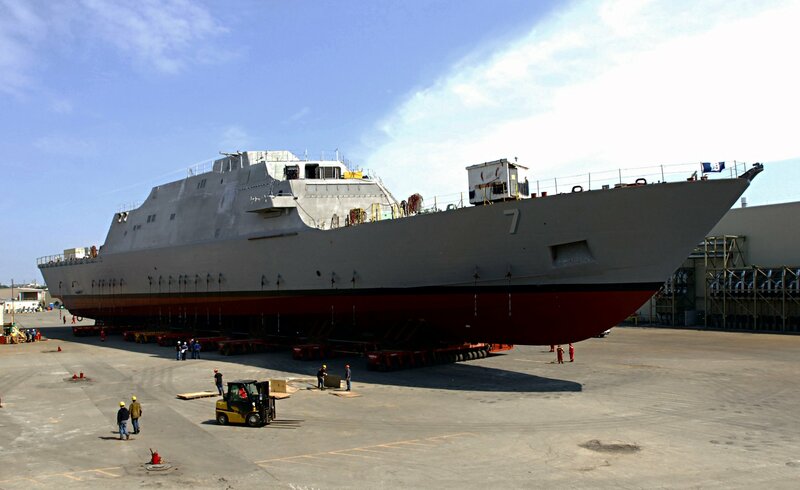 390k 13 July 2014: Marinette, Wis. - The future USS Detroit as she conducts acceptance trials. 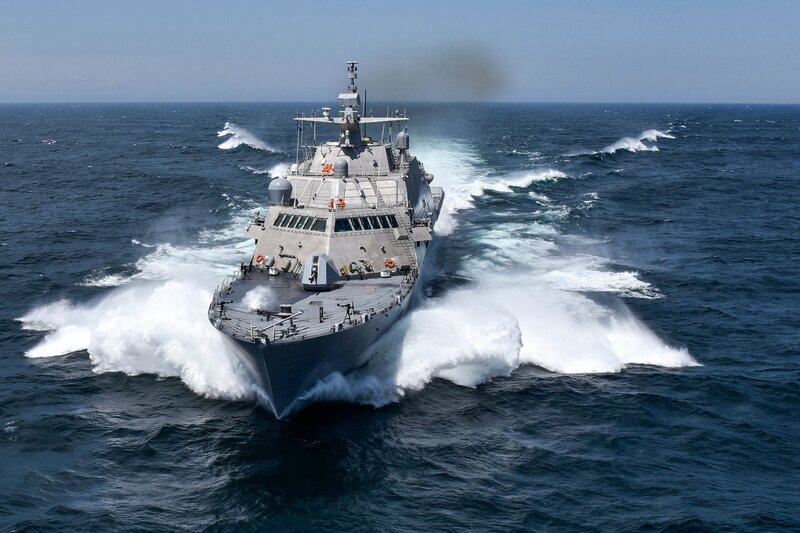 As the most networked ship in the Navy, the LCS relies on Lockheed Martin�s cyber expertise to defend the Littoral Combat Ship and ensure information assurance. 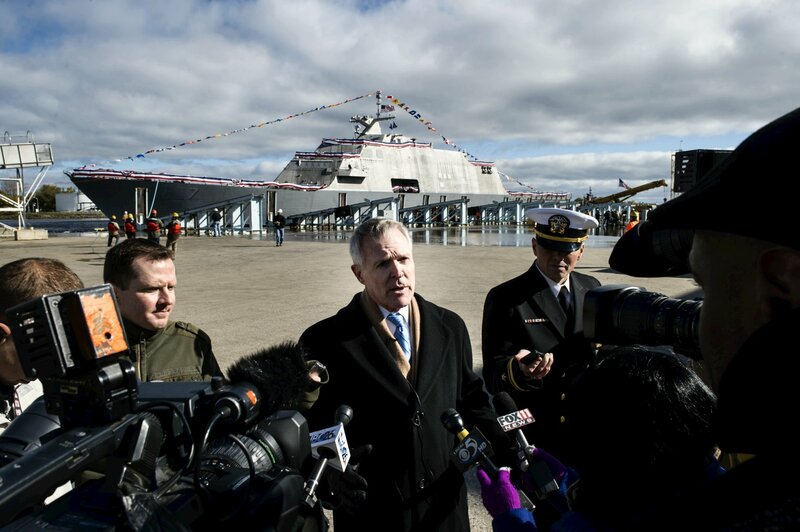 The Littoral Combat Ship�s highly automated systems rely on superior cyber security. 484k 14 July 2016: Marinette, Wisc. 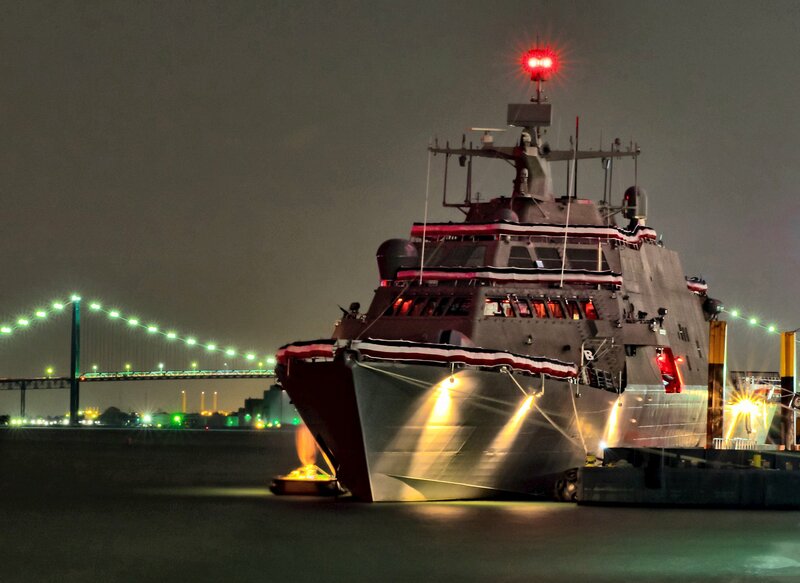 - Two views of the future USS Detroit (LCS 7) as she conducts acceptance trials. Acceptance trials are the last significant milestone before delivery of the ship to the Navy. 386k 18 October 2016: Detroit, Mich. - A beautiful night view of the future USS Detroit (LCS 7) moored at the downtown Detroit Riverfront, near the GM Renaissance Center. 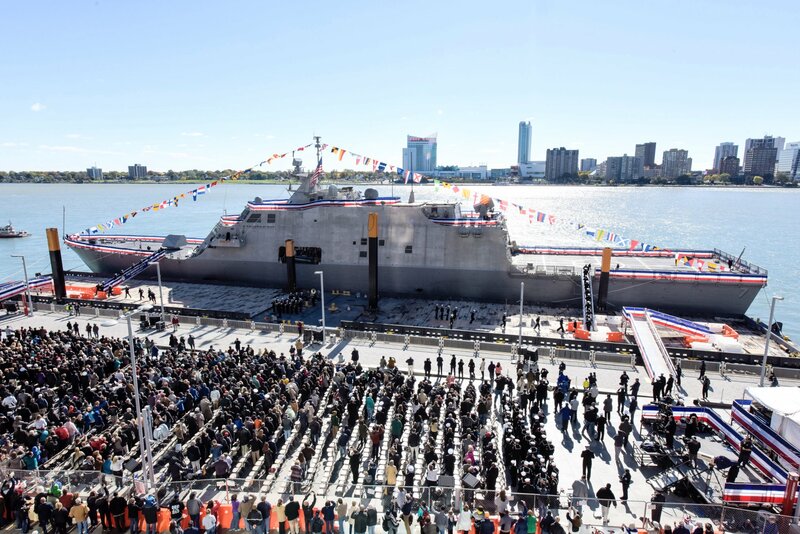 505k 21 October 2016: Detroit, Mich. - The future Freedom-variant littoral combat ship USS Detroit (LCS 7) is pierside on Detroit's waterfront in preparation for its commissioning on 22 Oct. 2016. 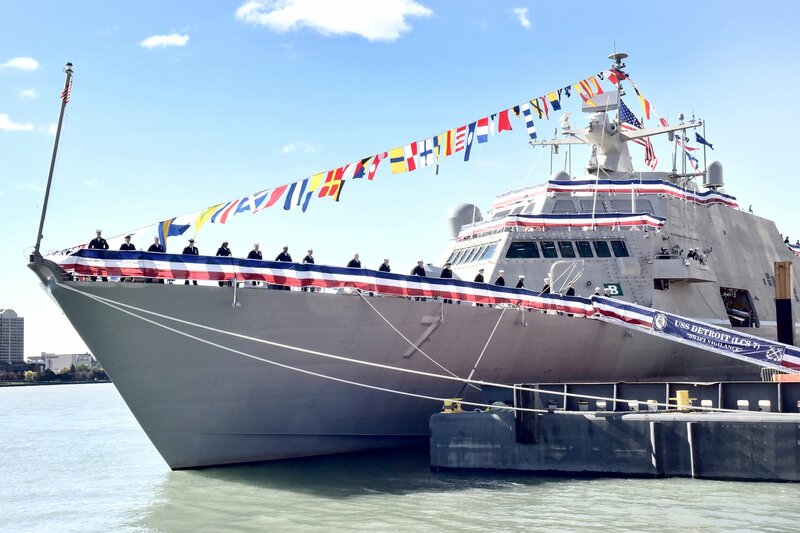 LCS-7 is the sixth U.S. ship named in honor of city of Detroit. 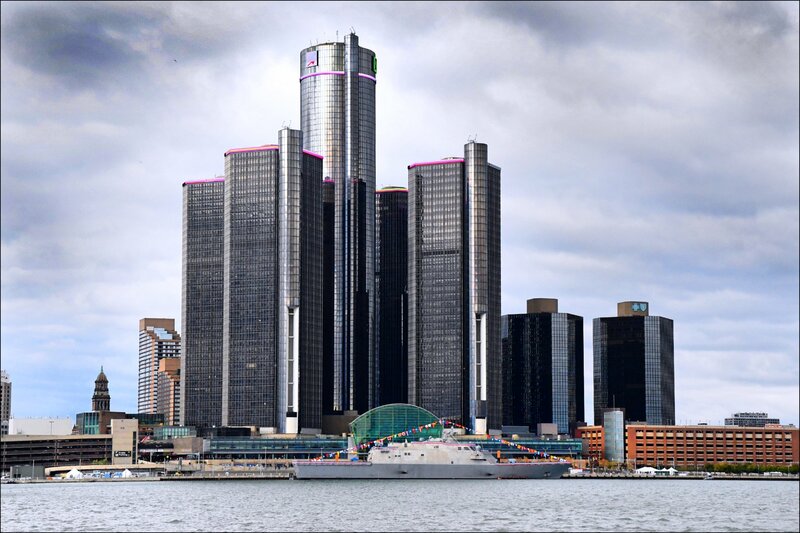 505k 21 October 2016: Windsor, Ontario - Taken from across the river in Canada, the future Freedom-variant littoral combat ship USS Detroit is pierside on Detroit's waterfront in preparation for its commissioning on 22 Oct. 2016. 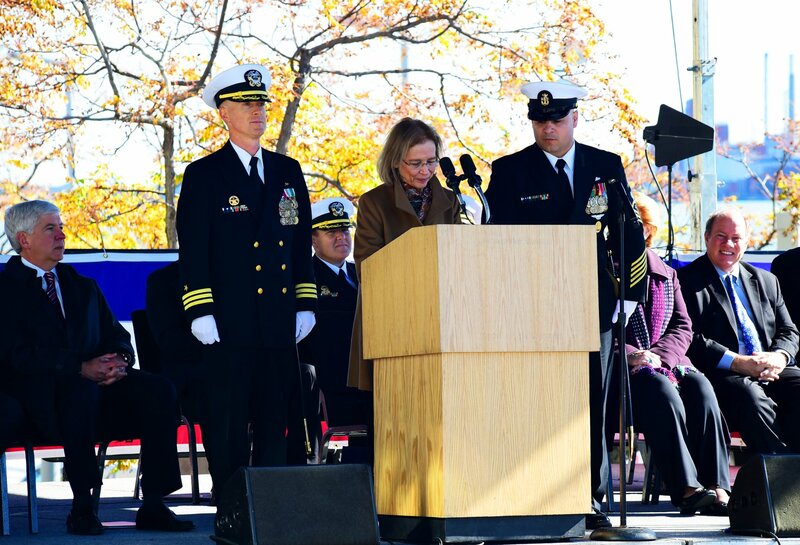 22 October 2016: Detroit, Mich. - A series of commissioning photos beginning with ship's sponsor Mrs. Barbra Levin, wife of Senator Carl Levin and a Detroit native, giving the command to "Bring the ship to life!" and ending with Cmdr. 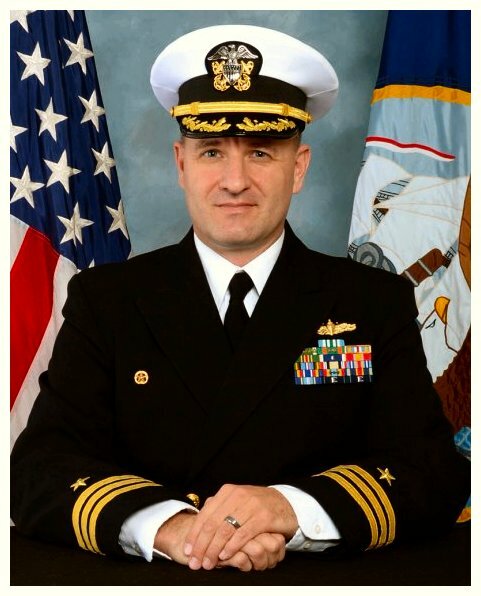 Michael Desmond reporting to Commander U.S. Fleet Forces Command, Adm. Philip Davidson, that the ship is "Manned and ready." 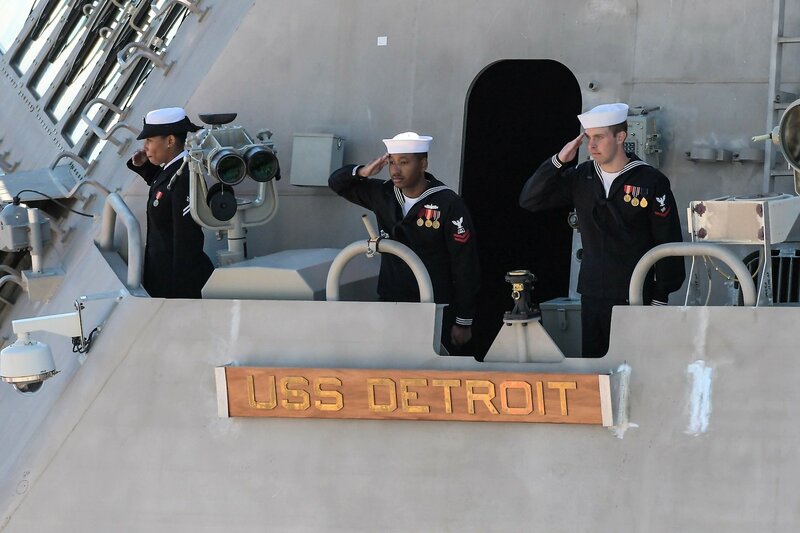 213k 22 October 2016: Detroit, Mich. - The national ensign flies over the Navy's newest Freedom-variant littoral combat ship, USS Detroit after the ship's commissioning ceremony. 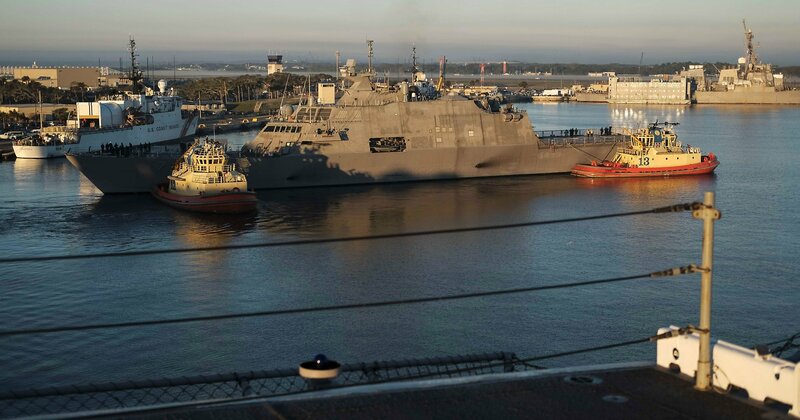 305k 23 November 2016: Mayport, Fla. - Freedom-variant littoral combat ship, USS Detroit (LCS 7) arrives at new home port at Naval Station Mayport after completing her maiden voyage from Detroit, where the ship was commissioned on 22 October. 213k 30 December 2016: Mayport, Fla. - The official party salutes as the National Anthem is sung during the Littoral Combat Ship Squadron (LCSRON) 2 homeport shift ceremony to welcome USS Milwaukee (LCS 5) and USS Detroit (LCS 7) as LCSRON 2 assets onboard Naval Station (NAVSTA) Mayport. 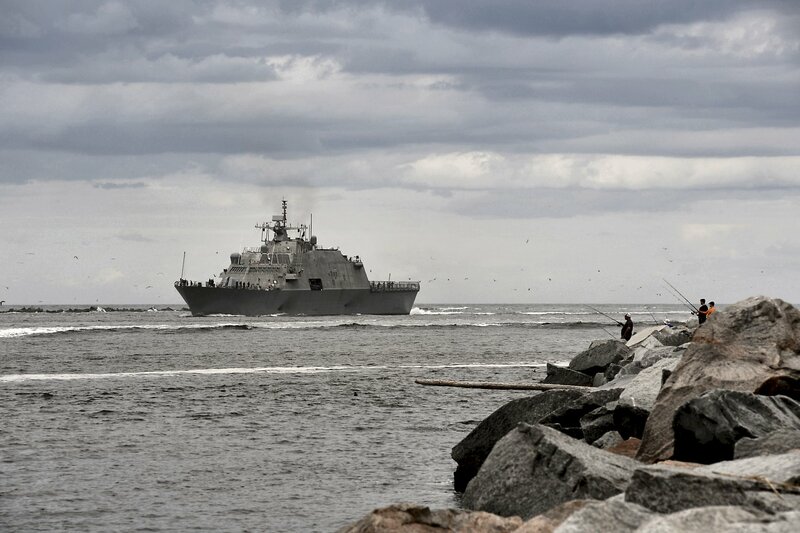 As the immediate Superior in Command of littoral combat ships home ported at NAVSTA Mayport, LCSRON 2 is responsible for the training, readiness, maintenance and support of assigned ships. 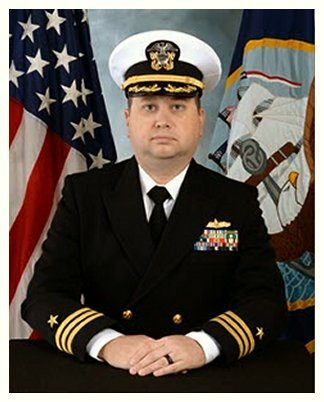 306k 30 December 2016: Mayport, Fla. - Rear Adm. Sean Buck, commander of U.S. 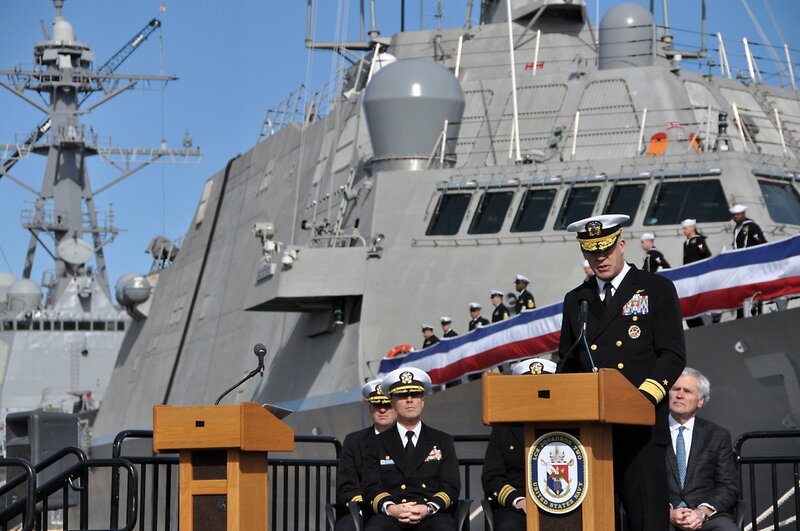 Naval Forces Southern Command and U.S. 4th Fleet, speaks at a ceremony welcoming the Freedom-variant littoral combat ships USS Milwaukee (LCS 5) and USS Detroit (LCS 7) to Mayport, Fla.
384k 25 January 2017: Mayport, Fla. - Littoral combat ship USS Detroit (LCS 7) prepares to moor at its homeport as seen from aboard amphibious assault ship USS Iwo Jima (LHD 7). 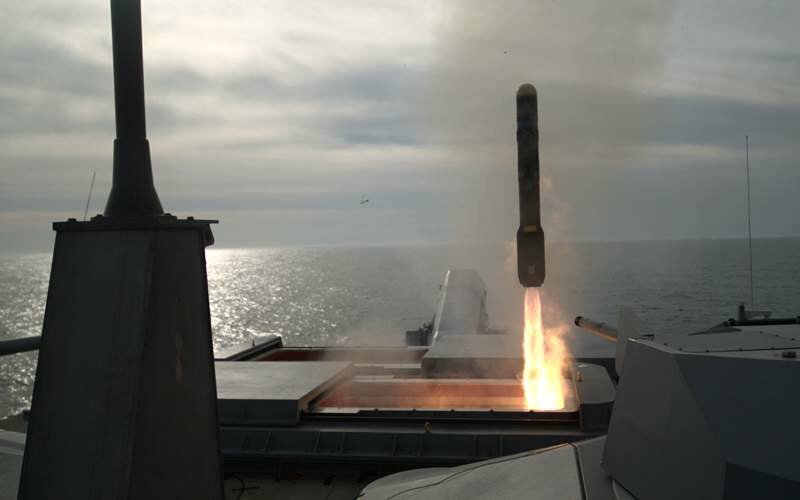 31k 28 February 2017: The Atlantic Ocean - The littoral combat ship USS Detroit (LCS 7) launches a Longbow Hellfire Missile during structural test firing (STF) off the coast of Norfolk, Va. STF is part of the developmental test program for the Surface to Surface Missile Module. 25k 28 February 2017: The Atlantic Ocean - The littoral combat ship Detroit launches a Longbow Hellfire Missile during structural test firing (STF) off the coast of Norfolk, Va. STF is part of the developmental test program for the Surface to Surface Missile Module. 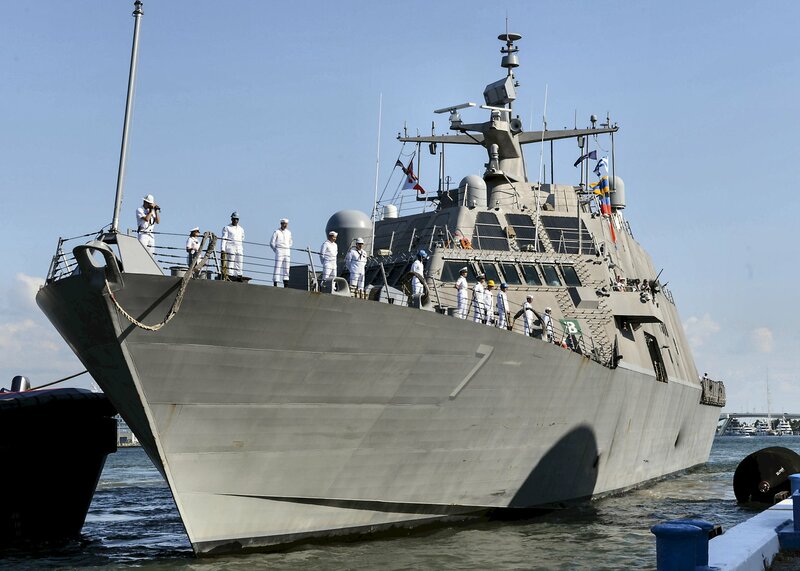 315k 30 April 2018: Fort Lauderdale, Fla. - Sailors man the rails as the littoral combat ship USS Detroit (LCS 7) prepares to moor in support of Fleet Week Port Everglades. 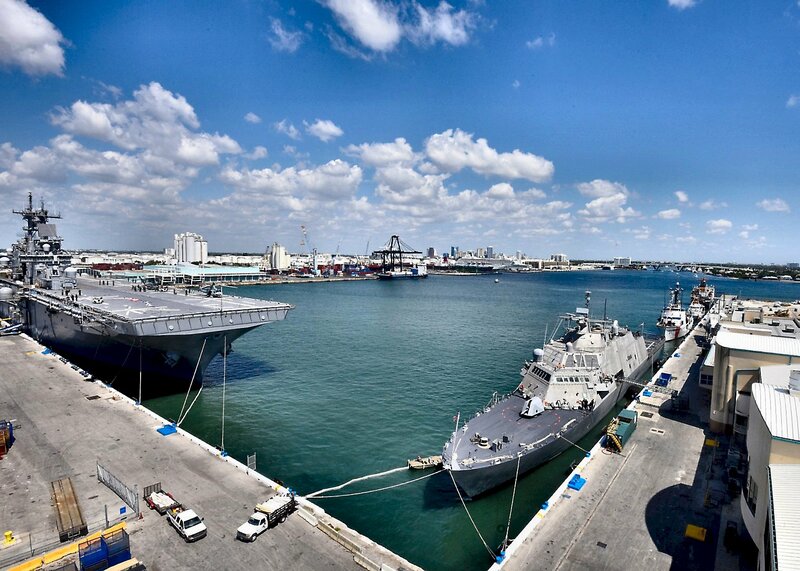 Fleet Week Port Everglades provides an opportunity for the citizens of South Florida to witness first-hand the latest capabilities of today's maritime services, and gain a better understanding of how the sea services support the national defense of the United States. 363k 30 April 2018: Fort Lauderdale, Fla. - The amphibious assault ship USS Kearsarge (LHD 3), USS Detroit, the Coast Guard Cutters Confidence, Robert Yered and Willow moored along the piers in Port Everglades to start 2018 Fleet Week. 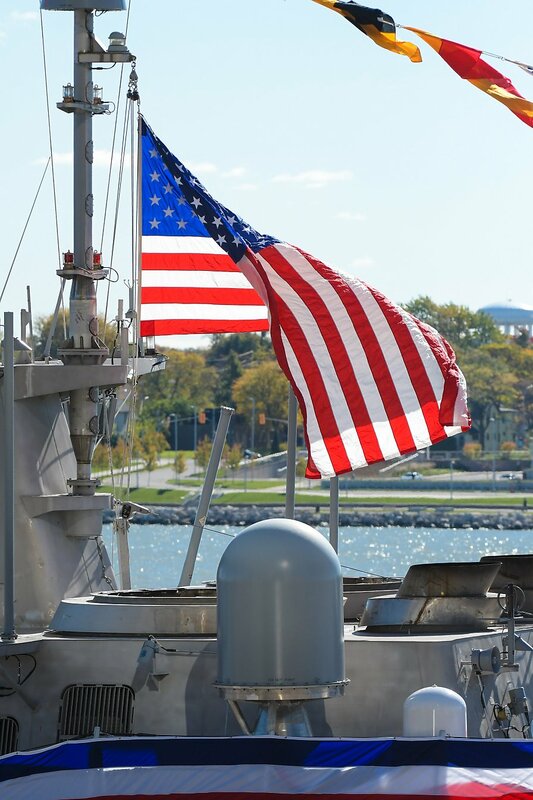 The Port Everglades Fleet Week is an annual event where Coast Guard and Navy service members are honored for their service by the local community. 253k 27 September 2018: the Atlantic Ocean - Sailors aboard the Freedom-class littoral combat ship USS Detroit (LCS 7) conduct a replenishment-at-sea with the Lewis and Clark-class dry cargo and ammunition ship USNS William McLean (T-AKE 12). Detroit is operating in the Atlantic Ocean supporting the testing of the littoral combat ship surface ship missile module. 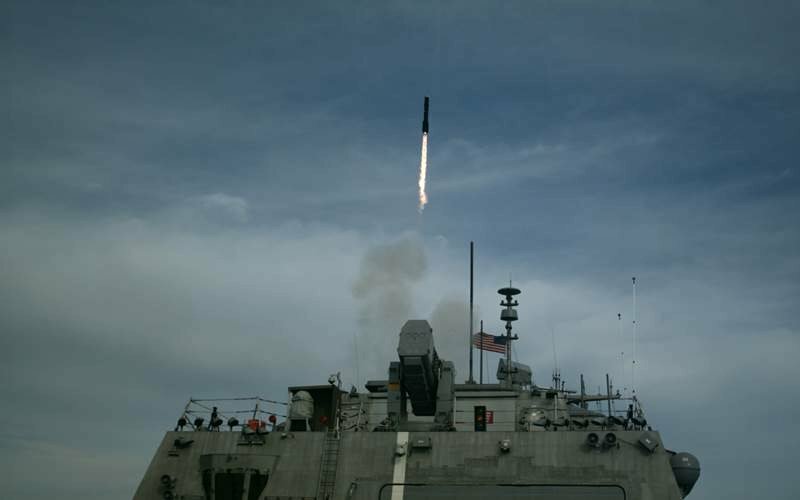 55k 27 September 2018: the Atlantic Ocean - The Freedom-class littoral combat ship USS Detroit (LCS 7) fires an AGM-114L Longbow Hellfire missile during a live-fire missile exercise. 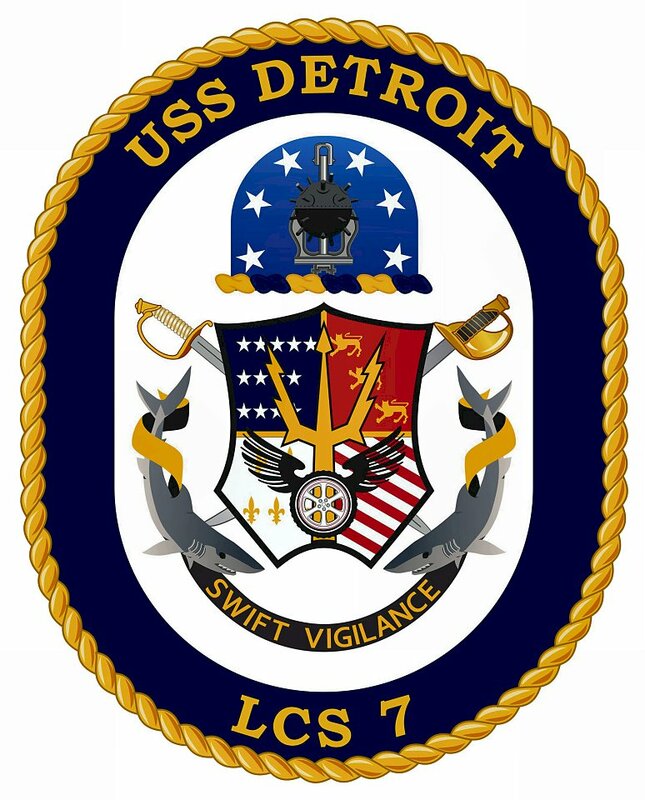 Detroit is operating in the Atlantic Ocean supporting the testing of the littoral combat ship surface ship missile module. 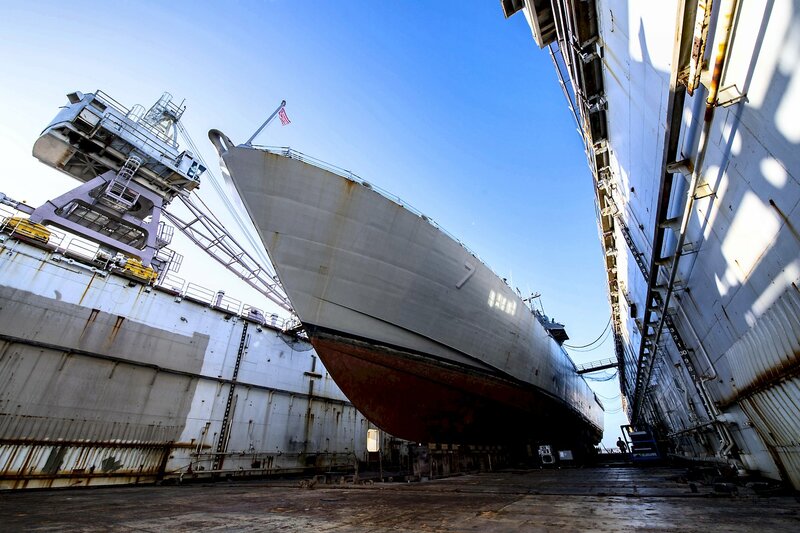 474k 29 March 2019: Jacksonville, Fla. - The Freedom-class littoral combat ship USS Detroit (LCS 7) receives scheduled maintenance and upkeep during a scheduled dry-dock maintenance availability phase at BAE Systems shipyard in Jacksonville, Florida. 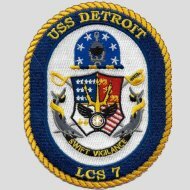 View the USS Detroit (LCS 7) DANFS history entry located on the Naval History and Heritage Command web site.